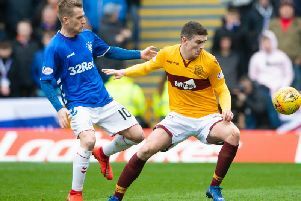 Rangers winger Ryan Kent will contest a Scottish Football Association charge which leaves him available for the Ladbrokes Premiership game against Hearts at Ibrox on Wednesday night. The on-loan Liverpool player was accused of committing a red-card offence by lashing out at Celtic skipper Scott Brown in Sunday’s Old Firm match at Parkhead, which finished 2-1 for the home side. Kent knocked Brown to the ground in the wake of James Forrest’s winning goal but referee Bobby Madden and his fellow match officials appeared to miss the incident. Rangers and Kent, facing a two-match ban following the notice of complaint, had until 3pm on Wednesday to accept the charge - which came after three former match officials unanimously declared he should be punished for the incident - but he did not and now a fast-track tribunal will take place on Thursday. Striker Alfredo Morelos is suspended for four matches after receiving his fifth red card of the season following an elbow on Brown. Defender Andy Halliday also misses the Hearts game after he picked up his second yellow card after the game for remonstrating with Brown following the Celtic midfielder’s celebrations.